cryptonaut-in-exile: (Cruel and ...?) Unusual judge sentences drunk driver to church. 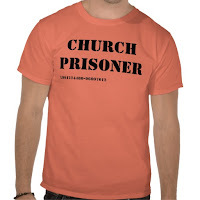 There is likely an alternative sentence written into the decision if the defendant fails to go to church every Sunday. That would be the key for me. If the judge usually hands down four-year sentences, and THIS sentence was "4 years or church," then the defendant is not in a WORSE position than he would have been in otherwise. However, if the judge usually hands down two year sentences and THIS time it was "4 years or church," then that's a problem. Sitting in a pew and thinking about his week ahead isn't going to kill him, I guess. But it will probably get overturned on appeal. I get your point about the church sentence length compared to the regular sentence length, but you'd probably want to measure in hours since church is only 16 hours out of your Sunday (or, at least I remember it felt that way as a kid) where prison is every hour of your every day for the length of the sentence. There's also the risk of sexual assault to consider. Although as a young fellow, I'm not sure where his risk of getting molested is lower, prison or church? I question the motives of the church that becomes the executioner, so to speak.